Quiet Places of the North Fork, a new series of paintings by North Fork artist Diane Alec Smith, in our Gish Gallery, thru Dec. 22. Riverhead Town 225th Anniversary Exhibition in our Weathervane Gallery, thru Dec. 22. WWI Centennial Exhibit: Over Here, Over There: Long Island & the Great War, in our Grand Staas Gallery, thru Feb. 2018. Votes for NY Women Centennial, in our History in Hall Gallery until Spring 2018. Saturday, February 24, 2018 Sandi Brewster-Walker, Long Island Whalers of Color. 1:00 PM. Thursday, March 1, 2018 Eileen Duffy, Behind the Bottle: The Rise of Wine on Long Island. 6:00 PM. Saturday, April 28, 2018 George Giannaris, Ferry Tales 2: When Hellenic Freezes Over. 1:00 PM. "How shall we know it is us without our past?" Ceylon Anderson (1904-1988) of Riverhead worked as a traffic engineer for the New York State Department of Transportation for over forty years, documenting the development of roads on Long Island from the early winding paths to the modern roadways and highways we know today. Thousands of his street and hamlet images, shot at locations across Long Island, were donated to the Suffolk County Historical Society's research library. 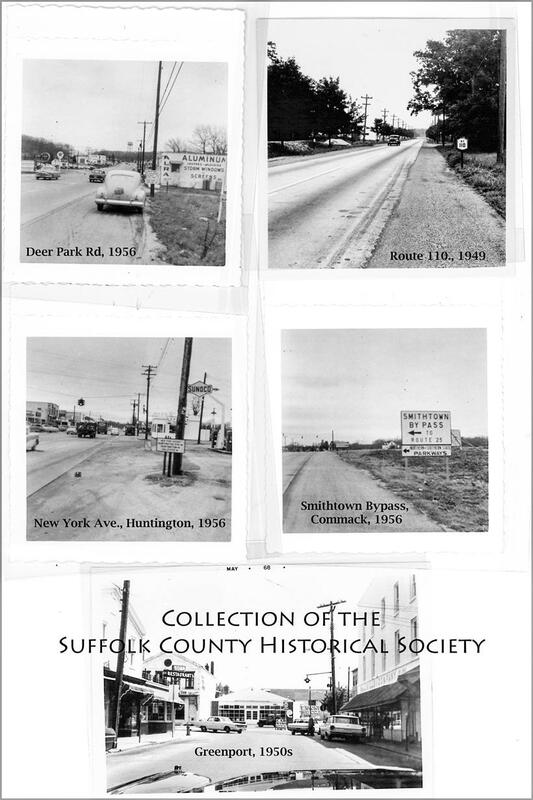 This collage shows a small selection of those images from the mid-twentieth century: Deer Park Rd., New York Ave., and the Smithtown Bypass in 1956; Route 110 in 1949; and Front Street, Greenport, in the 1950s. 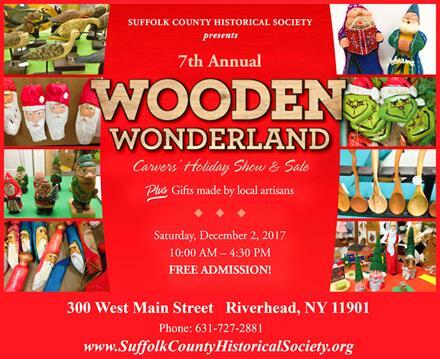 Don't miss our 7TH ANNUAL WOODEN WONDERLAND HOLIDAY CRAFT SHOW & SALE Tomorrow, Saturday, December 2, 2017, 10:00 am – 4:30 pm. Free admission. This family-friendly event will feature dozens of vendors offering local handmade wooden items as well as other local artisans' wares. Live woodworking and woodcarving demonstrations go on all day indoors in our historic galleries as well as outdoors on our Great Lawn. Holiday arts & crafts, ornaments, home décor, rustic Santas and gnomes, unique handmade carvings and other wooden items, local artisan-crafted gifts, handmade soaps, candles, hats & scarves, and much more (too much to list!). There's something for everyone on your holiday list! Interested in seeing more historical documents from the Collection of the Suffolk County Historical Society? Spend an afternoon at our Local History Research Library perusing our extensive collections. We're open Weds. - Sat., 12:30 - 4:30 PM. To view our Photo of the Week archives, visit our website at www.SuffolkCountyHistoricalSociety.org. 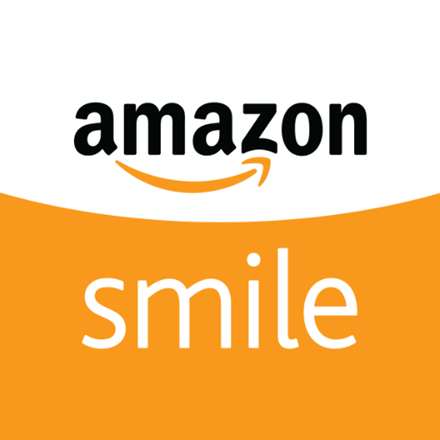 Amazon will donate 0.5% of the price of your eligible AmazonSmile purchases to the Suffolk County Historical Society whenever you shop on AmazonSmile. Click here to get started! If you've been enjoying our Photo of the Week, please consider becoming a member of SCHS. 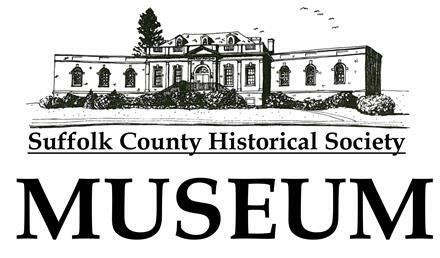 The Suffolk County Historical Society, founded in 1886, collects and preserves the rich history of Suffolk County and beyond. We offer a history museum, art galleries, a research library and archives, and a multitude of exhibits, programs, and educational lectures and workshops year-round. Our unique collections reflect more than three centuries of Long Island history. 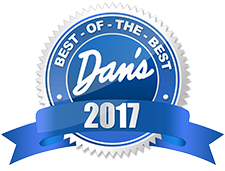 Click here to learn about Member Benefits! Copyright © 2017 Suffolk County Historical Society. All rights reserved. No part of this electronic document may be reproduced in any form without the written permission of the Suffolk County Historical Society.